We’re total newbies to heirloom tomatoes, particularly the exotic kinds. The first harvest was “Chocolate Vintage” whose brackish flavor took us completely by surprise (hmm … chocolatey appearance but salty!). Today, the 4th of July, I was pondering on the sad blossom drop of many of our heirlooms when I noticed one tomato that had a bit of orange at the bottom of the fruit. I looked at the variety on the label that I stuck in the soil next to the plant – “Marmande Vert“. I touched the tomato and it felt ripe! I asked Roy about picking a green tomato that felt ripe and he couldn’t give me a yes or no, so I trusted my instincts and pulled it off the vine. After all, “vert” means green. It came off reluctantly and I felt a little guilty, thinking of an old commercial about not picking fruit “before its time”. Is this Marmande Vert heirloom tomato ripe? 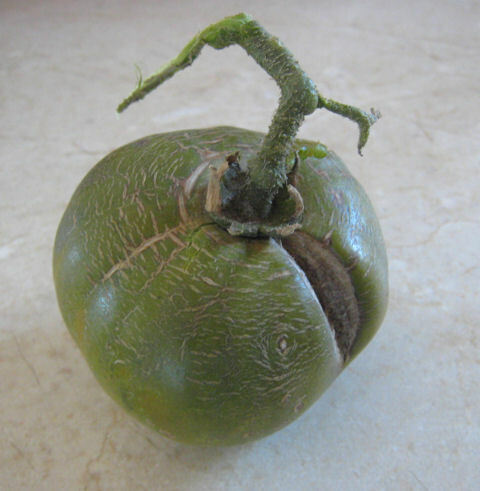 I looked at this unremarkable, somewhat pathetic little green tomato with a large crack. Well, it *feels* very ripe. Sliced it open and knew at once that this was definitely “its time”. The taste was mild, yet flavorful, the way you’d expect an heirloom to taste. The skin was not at all tough, thick or bitter. I was happy that my curiosity with these plants prevented fruit from rotting on the vine! Yes it is! 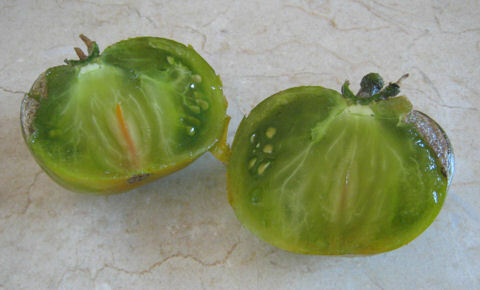 Marmande Vert is a delicious green heirloom. The red Marmande is one of the more famous heirlooms from France and one of Europe’s favorite “beefsteak” tomatoes. The green variety should have been cultivated at our former place along the Coast where it tolerates cool temps. I’m not optimistic that it will be producing much more for the rest of the season because of our dry, hot climate. We may have to cover the entire tomato bed with a light cloth to protect the plants from the searing heat! I have grown potatoes by mounding up with soil, and in bins with marginal success. Now I am going to try something new – a tower of potatoes! Friends of ours have used this technique successfully with one of those flexible plastic compost bins. The advantage of their system is that once the spuds are ready to harvest, all you do is remove the walls and the tower collapses, leaving you with pristine potatoes with no scars from being dug out of the earth with a spade. 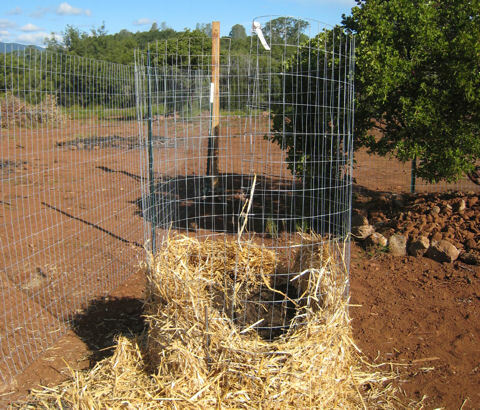 We couldn’t find that flexible plastic composter, so we used some leftover 4ft high, 10ft long wire fencing. Good ol’ geometry said that circumference = diameter x 3.14 or roughly 10ft fence divided by 3 means I could make a cylinder with a diameter of 3 feet. Worked for me! First layer of potatoes were about a foot from the ground. Kept cylinder partially open so I could reach inside to plant potatoes. "Sewed up" tower with end wires. 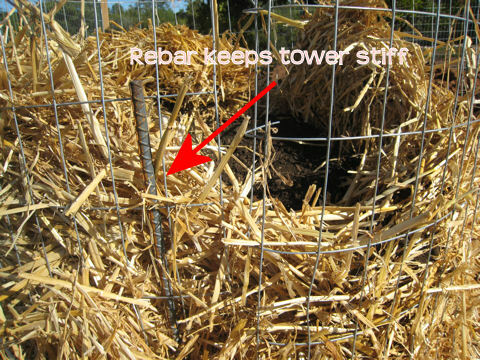 To stiffen the cylinder, I took some 2 ft rebar and wove it through the bottom of fence. A longer piece of rebar or fence post would have been ideal, but we didn’t have any laying around. The next step was to line the outside with straw (to keep the soil from coming out the holes) and fill the center with soil and some sand. Once I got about a foot off the ground I placed 4 potatoes around the circle about 6in from the edge and covered them. 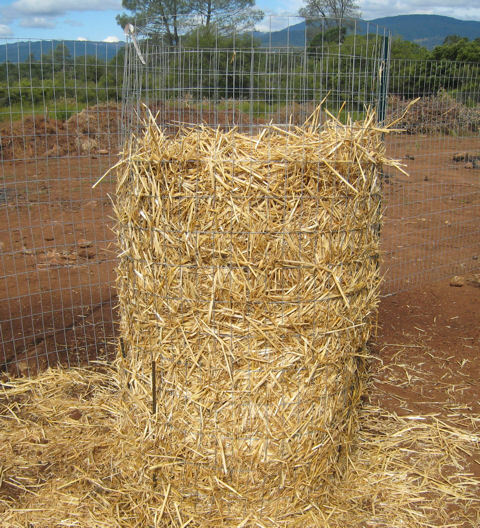 I continued to put straw on the outside and sand and soil on the inside until I put a good foot to 18 inches on top of the first layer. May 22nd - Finished putting layers of potatoes in tower. Fingers crossed that leaves will poke out of the holes on sides. You repeat the previous step in “layers”. When I was about 3ft off the ground I put a final set of potatoes on the top and covered them with 4 inches of soil. I also put a little Azalea fertilizer a couple of times during the buildup. Potatoes like slightly acidic soil, so I used an acid-loving plant fertilizer. June 24 - Yes! Potato plants are growing up and "out", poking through straw and fence holes. 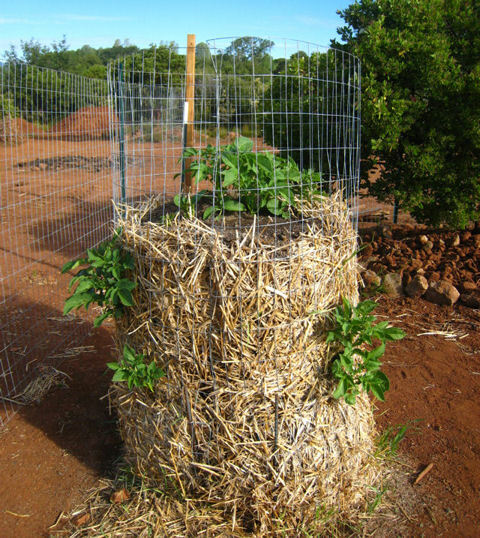 As the photos show, the potatoes in the lower-to-middle layers have grown their leaves out the sides and through the holes of the fence, and spuds will form on the inside of the cylinder. 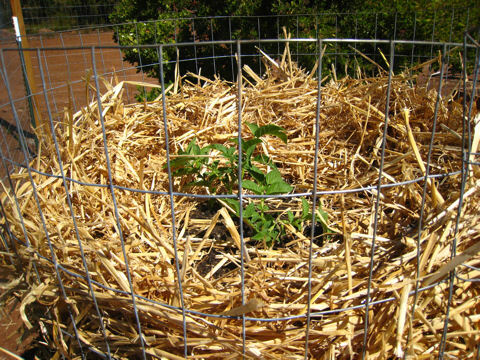 As the potatoes on the top grow, I continue to add soil, padding down the sides with straw to keep the soil from coming out, until I get to the top. If you bury potatoes, they can make new roots and spuds in the soil. 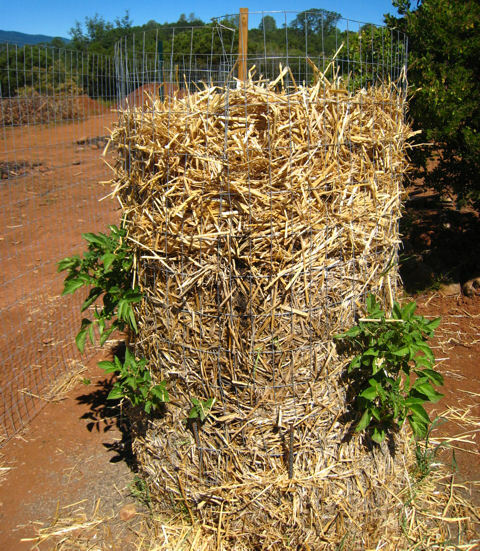 Padded sides at top with more straw, added soil in center to partially bury plants. We planted the potatoes on May 22nd, so we’re hoping for a harvest some time in late Aug. So stay tuned and we’ll let you know how this system worked for us! June 29th - Tower continues to grow up and out. We’ve always planted bush and pole beans (esp. for their nitrogen-fixation benefits), but late last summer, I decided to take a chance and grow plants that produced good, dry shelling beans that we could store for the winter. 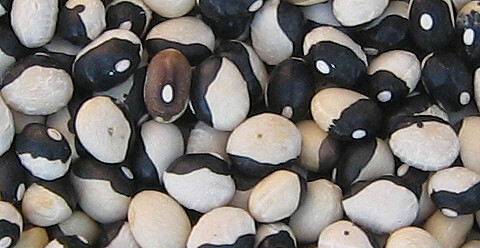 I chose one with a very unusual pattern, fondly known as “Yin Yang” calypso bean, and which I’d never seen in supermarkets. The harvested dry beans are about 2X the size of the bean seeds used to sow the plants! I shelled them in the fall and stored them in a coffee can, slyly placing it right next to the coffee machine until my wife got fed up and tucked them away on top of the fridge where she’d never see them again. Suffice it to say that the association of the words “beans” and “Roy” motivate her to pack her bags for a distant country. Luckily, she recently discovered a bean soup recipe in Jacques Pepin’s Fast Food My Way. Recalling how much she missed a hearty chili soup in the winter, and feeling insipired by the photographs, our calypso beans were finally put to work. Our calypso bean harvest for soup and salads. The result was a delightful, rich, meaty bean that you can use for bean salads, soups and baking. That coffee can of beans is now sitting on our kitchen counter and will be empty by the week’s end! Let us know if you’d like more info on growing these beans. This Green Globe yielded ~25 artichokes in 2008 but it’s time to let it rest. We’ll cut it down close to the ground like we did last year and watch this giant weed go nuts again in the spring. Our purple Violetto variety was smaller but more flavorful. One plant cost about $8 and yielded over $100 worth of food so far! Now that’s a 401K plan that can’t be beat 🙂 And easy maintenance, got a little “worm tea” from our vermicompost bin as fertilizer. Last time we sprinkled our own dried tarragon instead of thyme when we steamed these beauties. Highly recommended! Knew that artichokes were a thistle but didn’t realize thistles are a group from the sunflower Asteraceae family! They thrive in areas with mild winters and summers, hence they’re widespread on the California coast. So pooped after this big harvest! Am amazed these gems have lasted as long as they have. The seeds are so hardy and pop up like weeds in the spring. 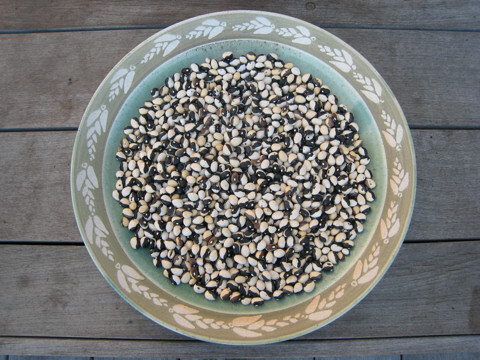 Send us a SASE and we’ll be happy to send you seeds for your next growing season: Plangarden, P.O. Box 1973, El Granada, CA 94018. Picking ollalieberries brightens up a gloomy day! It’s one of those June-gloom days in Half Moon Bay. We sorely needed a cheer-you-up activity and went ollalieberry picking! Took a break from Plangarden and headed over to Pescadero, checking out Phipps Ranch to raid their berry fields. Lucky for us, there was plenty of super sweet, ripe, almost black fruit to feast on. Great thing about Phipps is that you get to eat and harvest at the same time. We left with about 10 lbs – yum! BTW, our own ollalieberries that replaced the pineapple guava bushes earlier this spring are doing well but there won’t be much of a harvest this year. – Heat up gradually for several hours, reduce to desired consistency, knowing that it will thicken when cooled. We love putting this on everything – toast, pancakes, ice cream, yogurt, or just eating straight up!